I Heart Faces theme this week is A Touch of Whimsy. When I think of something whimsical I imagine dreamlike, warm lighting and extraordinary places. Now, the alfalfa field out back our house may not be rather dreamlike, but the golden lighting lent it to a somewhat whimsical vibe. So I felt this photo of my oldest fit this weeks theme of Whimsy. If nothing else, because of her expression. 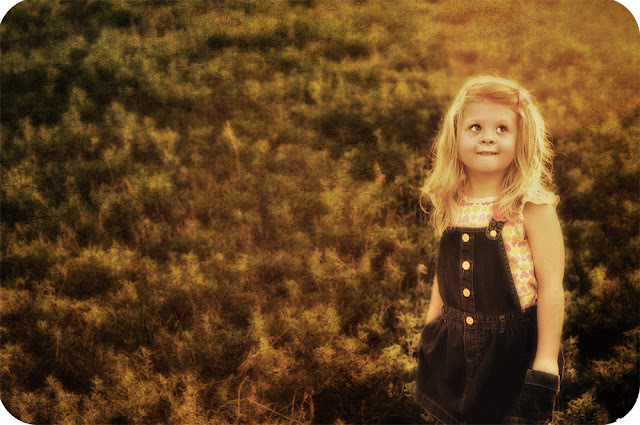 She was watching an airplane fly overhead, and whats more dreamlike and extraordinary to a child then flying? Check out all the other entries at I Heart Faces this week. I can’t wait to see the other entries and the different interpretations! What a sweet, full-of-wonder expression on your girl’s face! I love this shot, Leesha. I hope your picture does well! Beautiful shot! The colors and the textures, as well as her expression are wonderful. I love this Leesha. So adorable! Gorgeous photo. I love the textures and colors that you went with. So lovely!